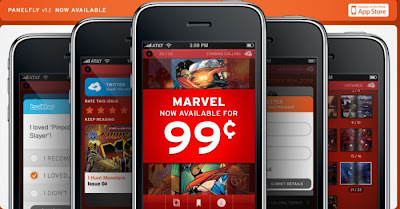 iVerse, Comixology, Panelfly are the new entrant app to give comic books on the iPhone Platform. Marvel Comics is a comic book publishing company, that has made available its comics publications to iPhone platform. Three iPhone applications namely iVerse, Panelfly and Comixology now support in-app download of Marvel Comics. But the biggest disadvantage is that it is available only for US Citizens. Panelfly brings impressive and popular Marvel Comics on the move. Marvel Comics Offered - Spider-Man series,X23, Iron Man, X-Men - Age Apocalypse. Panelfly App is available free of cost and can be downloaded. However the comics issues or publication needs to be purchased from the app which costs a few dollars. The iVerse Comics have added some good Marvel Comics titles which costs $1.99 per download. Marvel Comics Offered - Amazing Spider-man, Iron Man and more..
ComiXology app is alos available for the same $1.99 per download. Marvel Comics Offered - Astounding X-Men, Captain America, Civil War, Marvel Zombies, X-23, and X-Men: Age of Apocolypse series. ScrollMotion on the other hand have their own collections. If you do a search in iTunes for ScollMotion you can find all the comics publications they have released. This search feature is useful to find the required ones easily. ScrollMotion has published books in their part, including popular titles by Stephen King and Stephanie Meyer. However the price of it is not disclosed yet. But it is expected to be competitive. Panelfly offers comics for $.99 each for the first few issues, then $1.99 for later issues. May be a little discount!!! It seems..